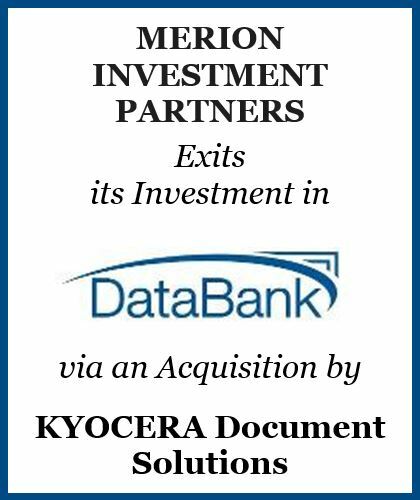 Merion is pleased to announce a successful exit from DataBank Holdings, LLC (“DataBank”), a leading outsourced imaging and information management provider, to KYOCERA Document Solutions (“Kyocera”). Headquartered in King of Prussia, Pennsylvania, DataBank is the country’s premier provider of business process automation solutions, with offices across the United States. Since 1991, the company has helped organizations maximize productivity and reduce operational costs by streamlining document, data and workflow business processes. The new relationship with Kyocera will open new service opportunities for DataBank. Chicago, IL – August 2, 2017 – Svoboda Capital Partners (“SC”) has sold its interest in leading outsourced imaging and information management provider DataBank Holdings, LLC (“DataBank”) to KYOCERA Document Solutions (“Kyocera”).